In my free time, sometimes I play the online RPG “EVE Online”. It’s a game notorious for being a sandbox - anything goes, which makes for grand strategy, espionage, betrayal, and camaraderie. Recently, the game became Free-to-Play, hopefully injecting some fresh faces in to the (over a decade-old!) game. I had a blast over the past few days and felt like maybe I had a story worth telling. Wormhole Space (“J-Space”) doesn’t have Stargates. Instead, each J-Space star system is known to have a connection (or two!) to a particular kind of other system (called a static connection - read more here) - which system of that kind it is changes every day. It takes a second to wrap your brain around, but once you do the concept is attractive - if your neighbors change every day, so too do the fights you get, the resources you can exploit, and your ease of resupply. 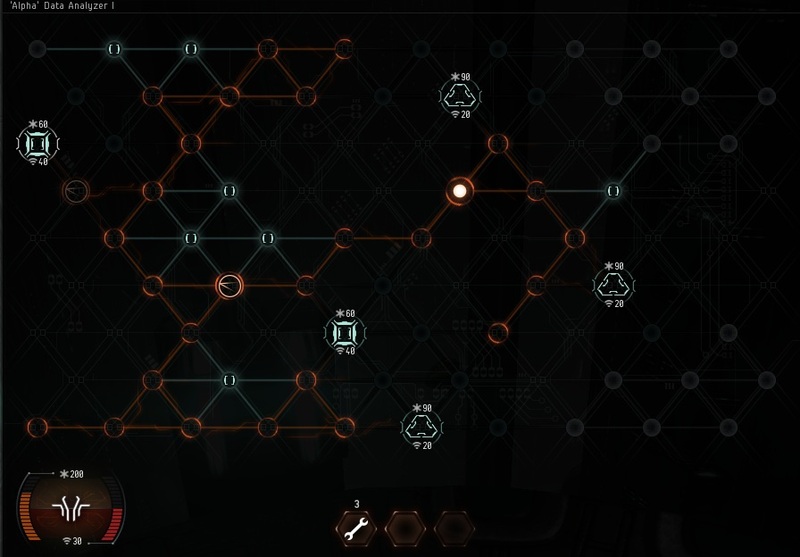 Yesterday, the static connection in my corporation’s home system led directly to the home system of a prominent Wormholer Corporation: Wingspan Enterprises. The denizens of J-Space range from the fabulously wealthy and dangerous (Hard Knocks) to neutral explorers (Signal Cartel) - Wingspan have a reputation for being persistent at low-level harassment. If I were to go looking for PvP action or work on making money doing PvE, they’d quite effectively hunt me down and put me out of my misery. Staying home wasn’t an option. I like the mix of activities involved in exploration - the minigames requires a decent amount of finesse, you have to travel through a large amount of space to find Signatures, and there’s skill in not getting killed by angry locals, people camping the Exploration Sites, or PvPers out roaming. It can make a pretty penny, too - I find it more engaging than other forms of PvE. The region of space where the wormhole deposited me is known for having particularly valuable exploration loot. 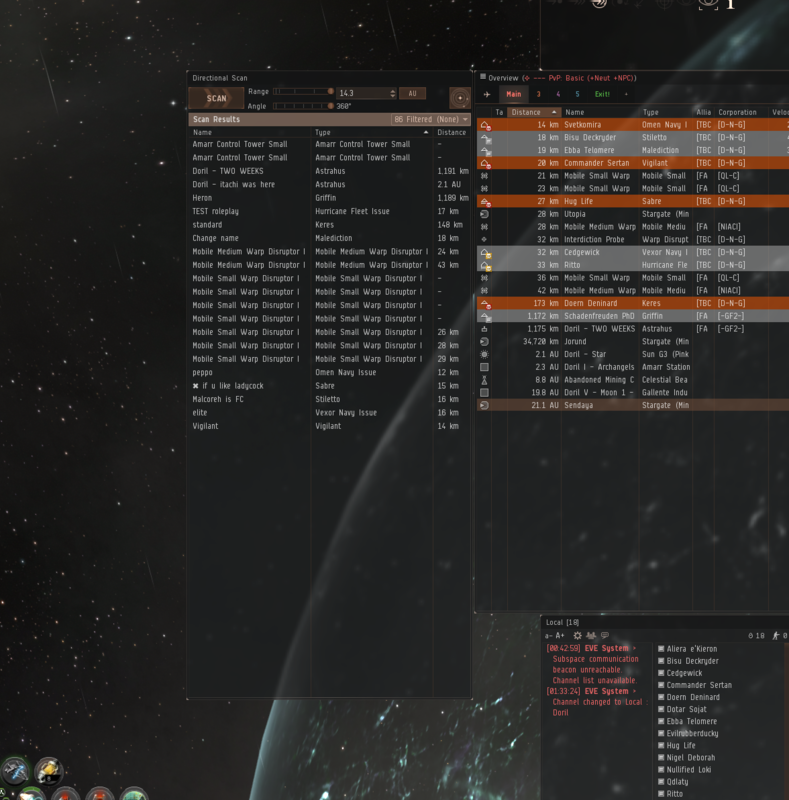 I gorged myself and collected ~100 Million ISK worth of loot before deciding to call it a night. I headed home through the same wormhole, but I hit a bug! The game held me, stuck between the nullsec K-Space system and a path home in J-Space. I stayed stuck for about 10 minutes and decided to give up and log off - hoping I’d still be alive the next day (read more about logging off mechanics and why I might not have still been alive here). When I logged in, I was thankfully still alive, but the wormhole connections had dissipated. I set out to find another, but wasn’t averse to doing a little more exploration along the way. 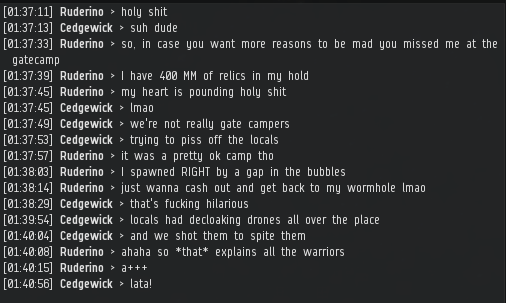 Randomness can be a cruel mistress, but sometimes it’s generous - while trying to find a wormhole home, I looted a further 300 Million ISK worth of treasure! For comparison, the 400 MM ISK in my ships hold could buy me the ship I was in (well kitted-out for exploration) more than six times over! A gatecamp. The ships you see on my “Overview” (the readout on the right-hand side) are all hanging around this stargate, waiting for someone to come through. They use “bubbles” (a mechanism for holding enemies in place) to make sure you can’t run, then unceremoniously kill you. You can’t see my ship in the screenshot, but its to the lower left - just outside the bubble you can see on the right half of the screen. I wasn’t trapped. I had a shot. I hit my afterburner, aligned towards the next stargate, and prayed I’d make warp. Two days of loot on the table - a cool 400 MM ISK. The campers launched another bubble, landing mere meters from my ship! They were closing in - at about 10km they would be able to hold me in place without their bubbles, so it was seconds before I’d die a fiery death. Then I made warp. I was free, heading towards the next gate - a path to hisec. We shared a chuckle at how narrowly I got away, and how much loot they missed out on. I still had 30 more jumps before I could sell off the loot at a trade hub and head to my home hole, but I’d make it. It was all mine.